Speaking about “upside opportunities” that exist for Microsoft, Ballmer talked about porting products to non-Windows platforms. “We don’t have our heads in the sand,” he said during the company’s meeting with financial analysts, which was held in a Bellevue, Wash., convention center and webcast live. In this context Microsoft is “working on everything that you think we should be working on,” Ballmer said. 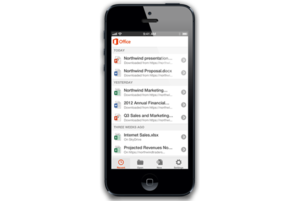 Microsoft released a version of Office for the iPhone earlier this year, but analysts say the company is leaving money on the table by not bringing its productivity suite to the iPad and Android tablets. Windows is the preferred platform for Microsoft applications and remains supremely important, but executives have less “religion” than people think and keep their “eyes wide open” with regards to the opportunities for generating additional revenue by porting products like Office to other platforms, he said. To be sure, Ballmer didn’t refer specifically to Office for iOS and Android, but it seemed clear that this is what he had in mind, since this issue has been a constant source of criticism for the company, which is leaving a lot of money on the table by not offering full, native versions of Office for the Apple and Google mobile OSes. He mentioned SkyDrive, Skype, and OneNote, which are available in iOS and Android versions, as examples of the direction Microsoft is going. However, he also said that part of the difficulty lies with Apple and Google in how they run their respective app stores. Skype, for example, is as “cross platform as could be, and we probably should use it to capture more functionality” but Apple frowns on allowing suites on its app store, he said. “They know they have to avoid [competitors] getting too much traction with their services on their devices, but we’re working away on it and it’s very, very important to us,” Ballmer said. “Devices come with services, services have to find their way onto non-Microsoft devices and we certainly have to support that without religious bias, if you will,” he added. Earlier, during a panel discussion, Qi Lu, executive vice president of Microsoft’s Applications and Services Group, had danced around a question about this issue, giving a quasi-professorial explanation for how Microsoft decides when and where to port software, but ultimately refraining from giving any concrete answer. Ballmer’s comments were the most surprising in the four-hour meeting, in which he and his lieutenants spent most of the time making a case for why Microsoft, despite its challenges, is in good shape to recover from past mistakes and take advantage of market opportunities in the coming years. Yes, they acknowledged, Microsoft is in a weak position in the smartphone and tablet OS markets, and Windows 8, Windows Phone 8 and the Surface tablets haven’t fixed that problem. But, they said, the company will try again with Windows 8.1, due in mid-October, with the still-pending acquisition of the Nokia smartphone business and with an upcoming second generation of the Surface devices. They went over the company’s strategy to transform itself from a provider of packaged, on-premises software to a provider of devices and cloud services. They said this process is underway and will be helped by the recently announced reorganization designed to make the company work in a more cohesive way, a restructuring that is being implemented. Ballmer did specifically list four areas in which Microsoft must deliver in the coming years in order to succeed: Office 365 and the Azure cloud platform; Windows PCs; smartphones and tablets; and innovation in “high value” opportunities. Office 365, the cloud suite of productivity, messaging and collaboration applications, is doing very well and is on a $1.5 billion annual revenue run rate, officials said. It will be a vehicle for Microsoft to continue delivering other applications via the software-as-a-service (SaaS) model, Ballmer said. Despite the cratering of the worldwide PC business, Microsoft must stick with it, because the PC will continue to be the device of choice for people when they need to be productive, as opposed to tablets, which are more content-consumption devices, according to Ballmer. He said he’s confident Windows 8.1, due in mid-October, will offer “distinct improvements” over Windows 8. Chief financial officer Amy Hood gave a peek at how Microsoft plans to do its financial reporting starting this quarter to match its corporate reorganization. As part of the restructuring, Microsoft dissolved its five business units—the Business Division, which housed Office; Server & Tools, which included SQL Server and System Center; the Windows Division; Online Services, which included Bing; and Entertainment and Devices, whose main product was the Xbox console. Hood said Microsoft will provide more detailed explanations later about this new financial reporting structure. In the wake of the reorganization announcement, some people have expressed concern that it will be harder for outsiders to evaluate how certain key products are performing. However, Hood said she and Microsoft are committed to making the company’s financial performance clear to analysts, investors and the public in general. Meanwhile, COO Kevin Turner said the company has a “balanced and diverse business” in terms of the customer segments it serves, the products it offers and the split in revenue between the U.S. and abroad. Some critics maintain that Microsoft’s product line is too diverse and that far from unifying the company, it would be wiser to make certain units more autonomous. Microsoft officials didn’t provide any information about the ongoing process to pick a replacement for Ballmer, who recently announced his intention to retire at some point in the next 12 months. Speculation about who may get picked has become a Silicon Valley pastime, and there are questions as to whether the replacement will get leeway in rethinking some of Ballmer’s decisions, especially regarding the reorganization. For his part, Ballmer said that Google’s business practices “are worthy of discussion with competition authorities” and increasingly so, especially around the way the company bundles some of its products.